Bathrooms are stripped down rooms, few soft furnishing, lots of hard surfaces and a fair collection of glass, chrome, and other shiny white surfaces. Ensuring the lighting is right in your bathroom is important as well as a wall switch inside a bathroom because getting it wrong could be something that you have to live with every day. Balance is important. Aim for general lighting like the trimless downlights that provides good light levels with a wide distribution of light. In a smaller bathroom this could be a single light fixture, whereas a larger room would benefit from a dozen downlights. – Do not put a downlight directly over a sink but use one either side to reduce shadows. – Putting a downlight in a shower cubicle is great, but does not work so well over a WC. – Shadows are your enemy and soft light is your ally. Opal glass diffuses light, metal reflects or blocks. Finally, choosing the correct light does not mean spending large amounts of money, Lighting Styles offers many budget bathroom lighting options and still obtain great results. We hope we can help you have the type of bathroom you deserve. We suggest you start by looking or thinking about what lighting you have had in your bathroom already. Is it bright enough? Does it create shadows? If you apply cosmetics in your bathroom do the results look as good in daylight? Consider having more than one light in your bathroom, a single fitting in the centre of the room will give good illumination to the centre of the room but not much else. The bathroom mirror deserves special attention and a wall light either side will provide good illumination to the face. Alternatives to wall lights include recessed lights installed above the mirror or a strip light atop the mirror. For best results why not consider an illuminated bathroom mirror or bathroom cabinet with lighting built in? This not only provides lighting but you can hide all your toiletries inside too. Tasks such as applying make-up and shaving are much harder to accomplish with a poorly lit vanity unit. In this area, good colour-rendering lights are necessary to enable you to see yourself in a natural light whilst reducing shadows on your face. When light shines only from above or behind, you will see unsightly dark shadows under your eyes and the texture of your skin will be accentuated. Frontal lighting is necessary to reduce both contrast and shadows. How much light is required in your bathroom? If you currently have a 100w lamp in situ you may want to use 4 x 50w downlights or 4 x 35w downlights to create similar light levels. You will need recessed fittings because halogen lamps have a reflector built in and have an intense beam whereas a 100w bulb gives out light in all directions. If you install too much lighting in the bathroom you can always lower the wattage of the lamps used in each fitting. Dimming your bathroom lighting is another option by use of a pull-cord dimmer. This will let your bathroom be bright and invigorating in the morning and soft and subdued in the evening. 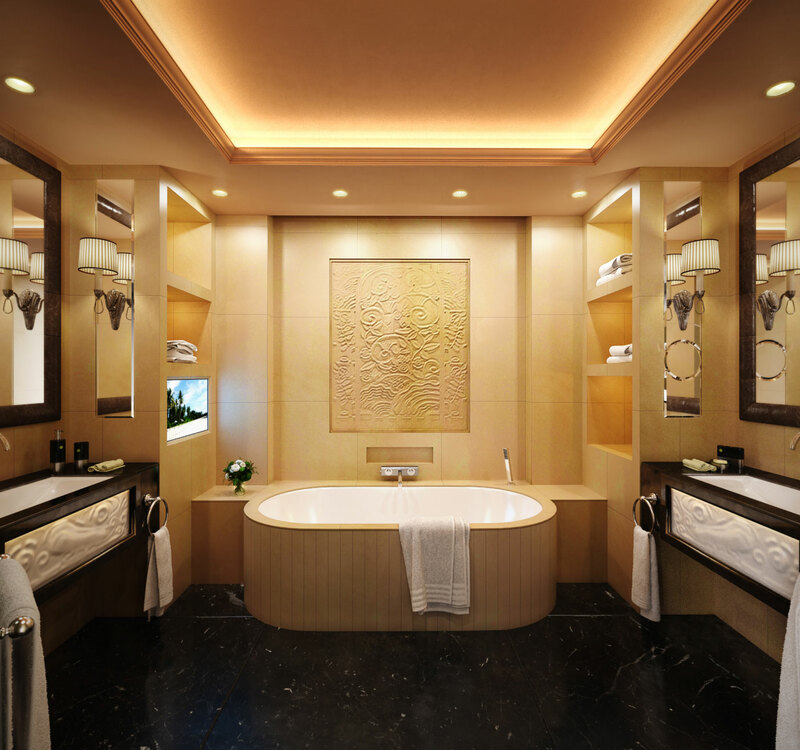 In addition to lighting for the vanity mirror, good general lighting is of maximum importance. Electricity, water and bare feet can be a lethal mixture. Pay special attention to current regulations to ensure the design of your wet areas are safe. Electric shocks received in wet areas are more likely to be fatal.